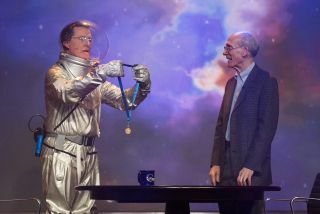 Galactic commander and talk show host Stephen 'Tiberius' Colbert presented Ed Stone with a NASA Distinguished Public Service Medal for his work on the Voyager spacecraft over the past four decades. Stone was a guest on Colbert's show on Dec. 3, 2013. When NASA wanted to present veteran Voyager project scientist Ed Stone with the Distinguished Public Service Medal — highest honor for a non-government individual — for 40 years of amazing work, the space agency knew just who to call: Stephen Colbert. Clad in his own version of a spacesuit, Colbert presented Stone the award in style on his Comedy Central talk show The Colbert Report on Dec. 3. A member of the California Institute of Technology since 1967, Ed Stone became project scientist for NASA's Voyager mission in 1972, and has been the only person to hold the position over the spacecraft's extended voyage. Launched in 1977, Voyager 2 became the first spacecraft to visit Uranus and Neptune in the 1980s, while Voyager 1 is the first to measure interstellar space. Stone supervised these investigations, as well as the twin crafts' flybys of Jupiter and Saturn, and continues to examine the data streaming in from the edge of the solar system. Ed Stone, Project Scientist for NASA's Voyager mission since 1972, stands with his Distinguished Public Service Medal and accompanying certificate. He received the award on the talk show The Colbert Report on Dec. 3, 2013. Inspired to enter space exploration by Russia's launch of the Sputnik satellite, Stone has had a career spanning the space age. He served as director of the Jet Propulsion Laboratory from 1991 to 2001, overseeing NASA projects such as Galileo's mission around Jupiter, Cassini's mission to Saturn, and Pathfinder's Martian landing. Currently, Stone serves as vice president of the board of directors of the Thirty Meter Telescope project, which seeks to build the most powerful and advanced optical telescope in the world. Wearing a silver spacesuit straight from a 1950's science fiction movie, Colbert drifted across the stage to present the distinguished award to a surprised Stone. "I was on the Colbert Report to talk about what I think of as humankind's greatest—and certainly most extensive—journey of exploration, and I certainly didn't expect the host to hand me an award," Stone said in a statement. "That surprise on my face was real."